the art of mindful eating : StressEraser Portable Biofeedback Device. Does it seem too easy for life to make you feel stressed lately? Are you getting stressed too often? Do you suffer from job stress? Do you stress eat and gain weight? You may not realize it, but there's a biological reason why you feel this way, and it's called ergotropic tuning. Ergotropic tuning is a biological process that changes the way the nerves in your body respond to stress. Ergotropic tuning causes your nerves to respond faster and more strongly to stress. In other words, it makes you feel stressed more easily, more quickly, more intensely. The StressEraser is a device that can help you. 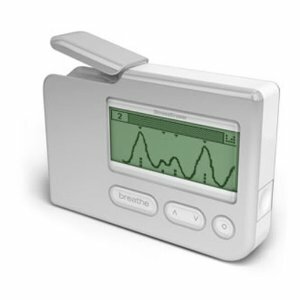 It is capable of measuring the effects of breathing on the parasympathetic system, and help guide the user on how use this information to reduce ergotropic tuning. The key is to use your StressEraser for 15 minutes each night right before you go to sleep. By using your StressEraser to activate your parasympathetic system at this time, your parasympathetic system can remain active all night long while you are sleeping. This simple 15 minute routine can result in hours of ergotropic reversal. With regular use, you will start to feel a sustained difference within a few weeks.